Our object this week helps us celebrate the 85th anniversary of the passage of the Pratt-Smoot Act on March 3, 1931. Pratt-Smoot helped create the National Library Service for the Blind and Physically Handicapped within the Library of Congress. 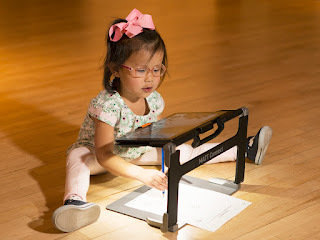 Originally, the NLS planned to circulate only braille books, but the American Foundation of the Blind and its director Robert Irwin championed the inclusion of audio books too. 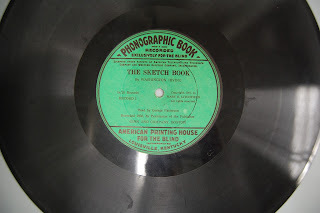 In 1936, the American Printing House installed a model sound recording studio, and by the end of the year, APH Superintendent A.C. Ellis was boasting that we were the only institution in the world with the capacity to record and press talking book records. Our first book was “Gulliver’s Travels,” but unfortunately no copies have been preserved. Our object is a the first record from Washington Irving’s “The Sketchbook,” which came on sixteen black vinyl 33 1/3 rpm phonograph records, one of four other books we recorded that year. You’ll note on the record label that it is a “Phonographic Book.” We started calling them “Talking Books” in 1937. It was narrated by APH legend George Patterson, a broadcaster for WAVE radio. You can hear a short excerpt here.